I have tried to follow your guide to what a category and keyword should be. But I feel like I need some more categorization. And I am afraid to get way to many categoires and thereby loose track of it all. Maybe not with the colors and all. But like a second "keyword" area. the advantage of categories resides in the fact that you can use them hierarchically, whereas keywords stand for themselves. Other than that, you can use them whichever way you like. From what you say, you do not need a hierarchical structure, so why don't you use keywords? If you want to differentiate between groups of keywords, you could have them start with special symbols, like @, #, _. In this way, the groups would be listed together. The same applies for categories, too, of course. It's a good idea with the symbols before a keyword. 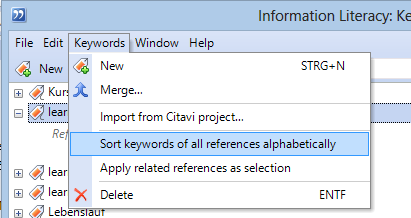 My issue is that we have imported all our references from an old "Reference Manager" project. Some of these references have more than 50 keywords. We don't want the "tags" to drown in the keywords. 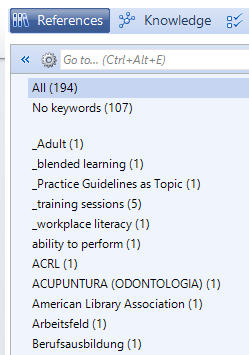 In total we have around 6000+ different keywords. Another idea could be to have a custom field you could add to "Lists" and name as pleased. 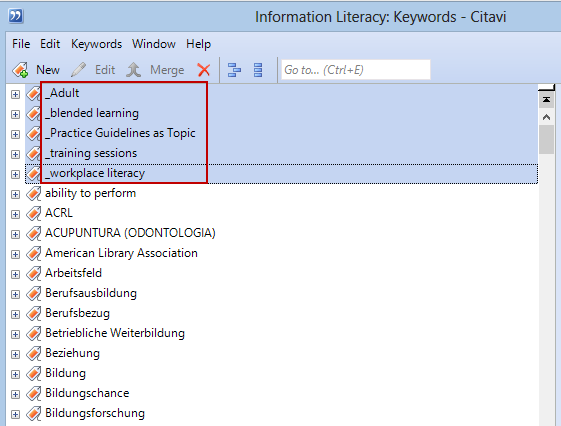 Or do you want to immediately see in all references which tags have been assigned to a title? Would this feature help? In the context tab, your _tags would be listed first. Or is it that I just do not understand what exactly you want to do? This is a great idea! I certainly think we can use this.